Current projects | Varms s.r.o. Garage house Vavilovova – Petržalka is an ideal parking project for all those who do not want to encounter with parking problems in their neighborhood anymore. Carefree, maximally safe and confortable parking in the heart of your home place, combined with modern environmental friendly architecture with a high technological standard – these are the top benefits that the project brings. 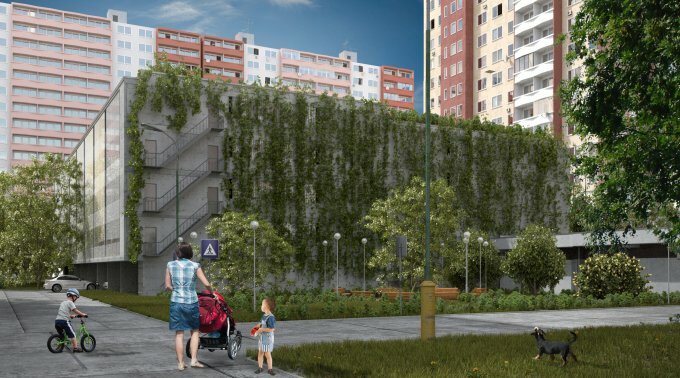 Garage house Vavilovova – Petržalka will grow in the urban neighborhood Petržalka between Vavilovova and Jungmannova streets; whereby it is geographically set right in the heart of a residential settlement. This unique location provides absolute connectivity with the surrounding residential units, excellent road access and many other benefits associated with the parking of your motor vehicles.